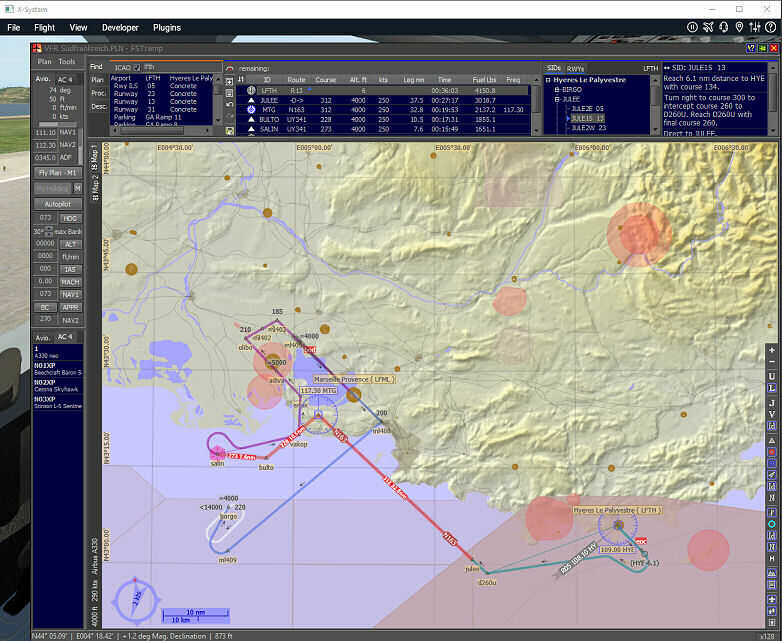 View of Simulator after FSTramp has been activated with the Hotkey Ctrl+F12. 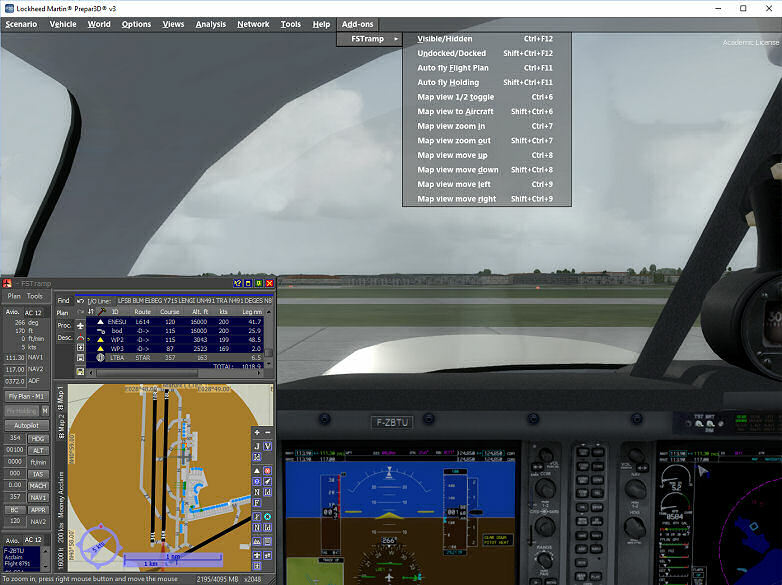 FSTramp covers almost all of the Simulator screen, and the FSTramp window cannot be changed in size or position in this mode. 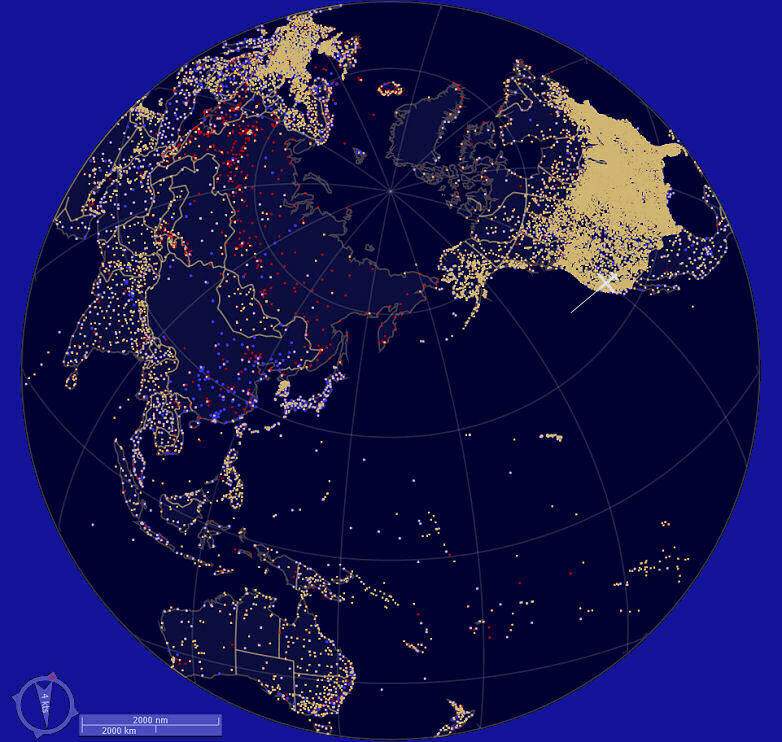 This docked view serves mainly as a global overview, and can be used for finding Airports, Navaids, etc. Terrain is shown in relief; this can be deactivated if you prefer monochrome blue or green colours for the continents. The relief is not an image, it is a coloured representation of the terrain height. An numerical indication of the height is located right of the mouse pointer. The accuracy is < 300 feet or 75 meters. With the Hotkey Shift+Ctrl+F12 the FSTramp window appears in undocked mode. Size and position of the window can now be changed. This window can be used as a small overlay, but also as a full screen on a second display. All sub-windows of FSTramp are adjustable in their size. This allows different sub-window arrangements for the two display modes. The Simulator Menu bar contains the item FSTramp in the Add-ons button, which shows a Menu with all Hotkeys for FSTramp.